This is not necessarily a bad thing, but those hoping for more from Home, especially in the Google Assistant department, will likely be at least a little disappointed, though the device does have a number of advantages over its main competitor, Amazon’s Echo. The Echo, however, still isn’t available in Canada, and Amazon hasn’t revealed a road map for the device’s release north of the U.S. border. This means that at least in the Canadian market, Google Home doesn’t have an official rival. This will change, and very soon, according to various sources close to MobileSyrup. It’s also easy to get your hands on an Amazon Echo in Canada, if you’re willing to take a few extra steps, though admittedly most people won’t want to bother given Home’s official availability. That said, Google Home is an impressive voice-activated assistant despite its flaws, and I’m excited to see where Google takes the IoT device in the future as it improves integration and adds new features. Unlike Amazon’s Echo, whether it’s the standard version of the device or the tiny but versatile Dot, Google Home actually blends impressively with most people’s homes. Similar to Google’s sleek Wifi router, Home looks like an object that belongs on a side table, rather than the traditional, dark, blocky aesthetic of a typical tech product. 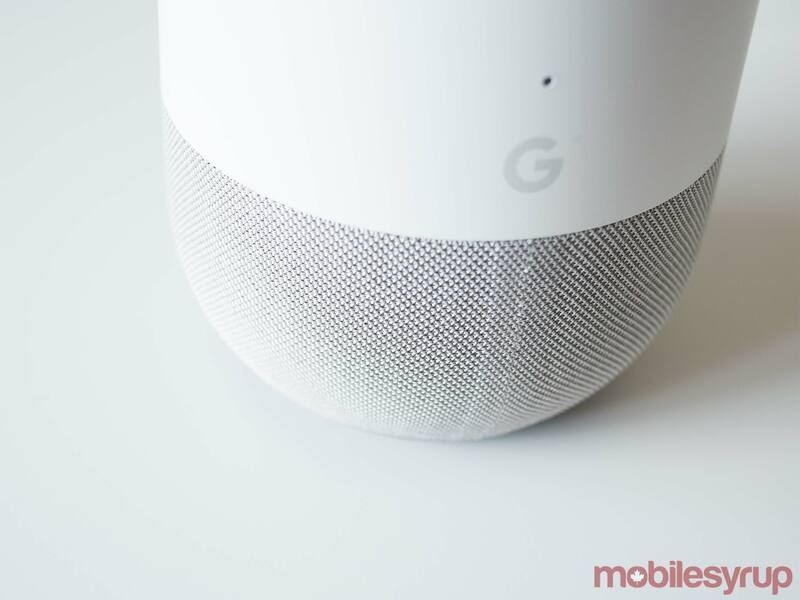 In terms of measurements, Google Home comes in at 142mm x 96.4mm, a size that makes it even easier for the tiny device to blend in with other household products. Home amusingly resembles an expensive, speaker and microphone-filled “air freshener” vase; its base is wide but the top of the device is slightly tapered. Each Google Home also comes with a grey fabric base that can be swapped out with either a ‘Carbon’ or ‘Copper’ replacement, priced at an additional $55 CAD (other more colourful bases are exclusive to the U.S. currently). There’s also a practical purpose for Home’s flat, inclined top, with this part of the device doubling as a capacitive touch panel that allows users to play/pause music and lower/raise its volume. It’s also the location of four multi-coloured lights that twist and twirl, indicating you’ve caught Home’s attention by saying the key “Okay, Google” activation phrase. When compared to the Echo’s ominous circling activation light, I prefer Home’s inviting multi-coloured array. 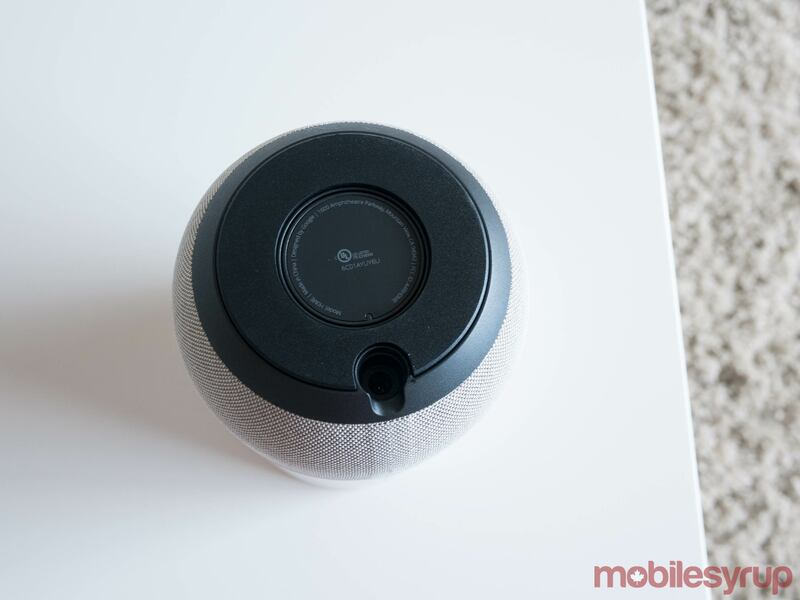 While the Echo also features physical controls that let you change its volume, Home’s capacitive touch panel feels considerably less precise when compared to its competitor’s wheel. That said, in terms of overall aesthetic, Home wins in every category when compared to Amazon’s device. Other Home components include two microphones located at the top of the device’s chassis (more on this later), and four speakers in its body, coupled with ‘passive radiators,’ designed to deliver clear highs and rich base, according to Google. In comparison, the Echo comes equipped with five microphones. When it comes to responsiveness, despite the fact that I have two Homes in my relatively small one bedroom+den apartment, the device often was unable to hear my commands, or misinterpreted them in some way, especially when asking it to play songs via Spotify. This isn’t an issue I’ve run into with the Amazon Echo, particularly after I tuned its voice recognition in the device’s troubleshooting settings. 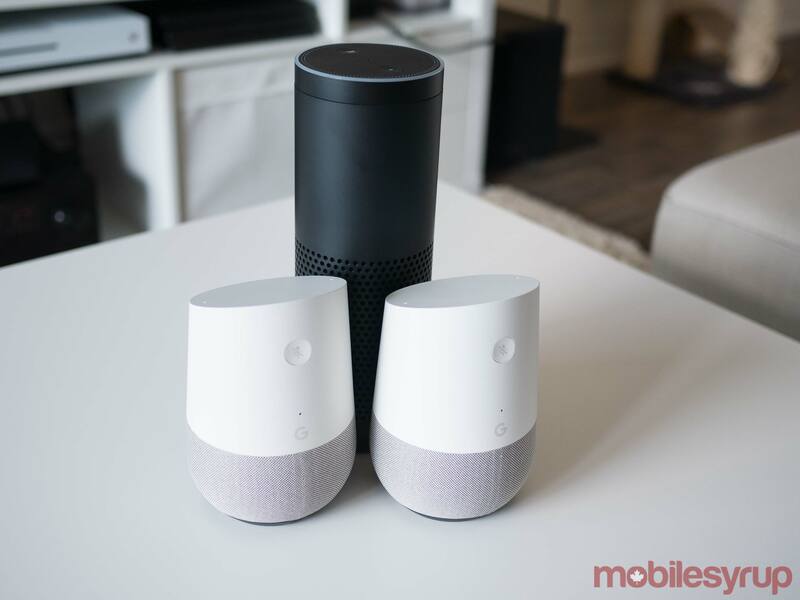 It’s also useful that multiple Google Homes can be used in conjunction, a feature that will likely come in handy for people with larger homes. 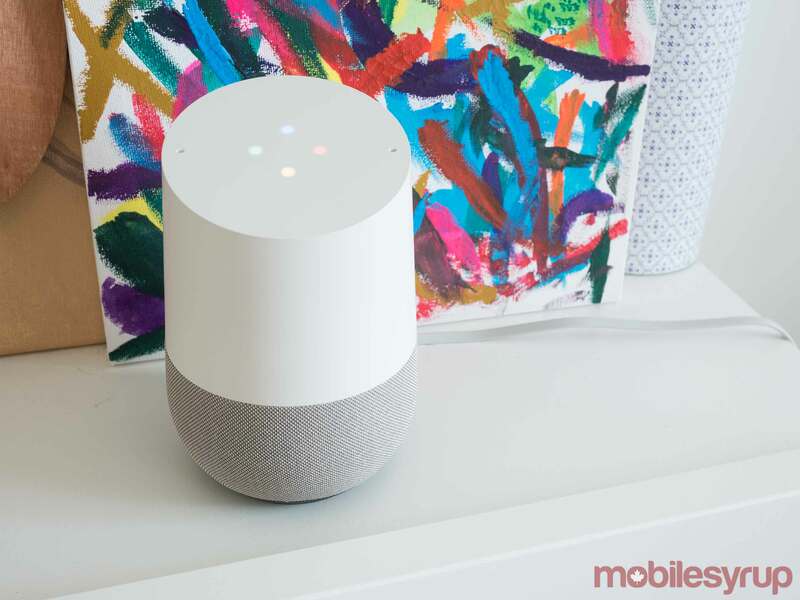 To be clear, Google Home still heard my commands 98 percent of the time, but there were a few frustrating instances where the device either ignored me, or misheard what I was saying completely, for some unclear reason. In terms of Home’s audio quality, I found the device’s output to be roughly on par with a mid-range Bluetooth speaker, though the Echo certainly offers a better listening experience (keep in mind that I’m far from an audiophile). Whether you opt for the Echo or Home, however, it’s important to note that you’re not going to get amazing sounding audio — this is not a high-end Sonos speaker. Apple’s upcoming HomePod will likely end up being the top-tier, expensive IoT speaker option when it launches next year (an official Canadian release date still hasn’t been revealed). All in, while Google Home dominates the looks department, it lags behind the Echo when it comes to audio quality. Home is also able to access a variety of different streaming services, including Google Play Music, YouTube Music and Spotify, but as you may have guessed, not Apple Music. This means that as long as you’re not an Apple Music subscriber, it’s easy to hook up Home to the music streaming platform of your choice — the process is simple and only requires a few taps in its dedicated iOS or Android app. Via Spotify, Home was able to play almost every single song I threw at it, even obscure Blink-182 songs no one is probably listening to but me. 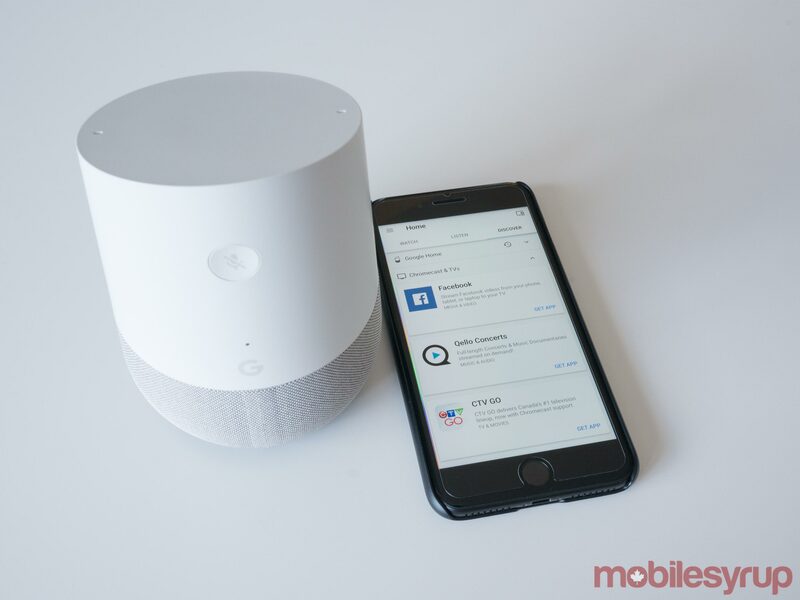 It’s also worth noting that the Canadian version of Google Home doesn’t include multi-account support, a feature that’s a must for anyone planning to use the voice-activated IoT device with multiple people. Google Canada says this feature is coming eventually, though there isn’t a clear release roadmap yet (it’s currently exclusively available in the U.S.). Placing this feature in the context of the broader standalone voice-activated assistant device market, Amazon’s Echo also still doesn’t support multiple users. As an early smart home device adopter, the Echo has evolved into the core of my various disparate IoT devices. Google Home seems to replicate and actually improve on what the Echo is capable of in terms of linking my IoT devices together — at least for the most part. For example, Home works great with Philips Hue lights, allowing me to actually alter the colour of individual lights with a simple command; this is something the Echo can’t do without complicated IFTTT integration. It also — as you likely guessed — works great with Google’s various Nest products, as well as Samsung’s line of SmartThings devices. Even LIFX’s smart home lightbulbs are compatible with Home, along with Toronto-based Nanoleaf’s various products, including the Nanoleaf’s modular Aurora lights. Unfortunately, Home doesn’t work with the Ecobee3, which is a strange move on the Toronto-based company’s part and a compatibility omission (Ecobee supports the Echo and Apple’s Home platform). 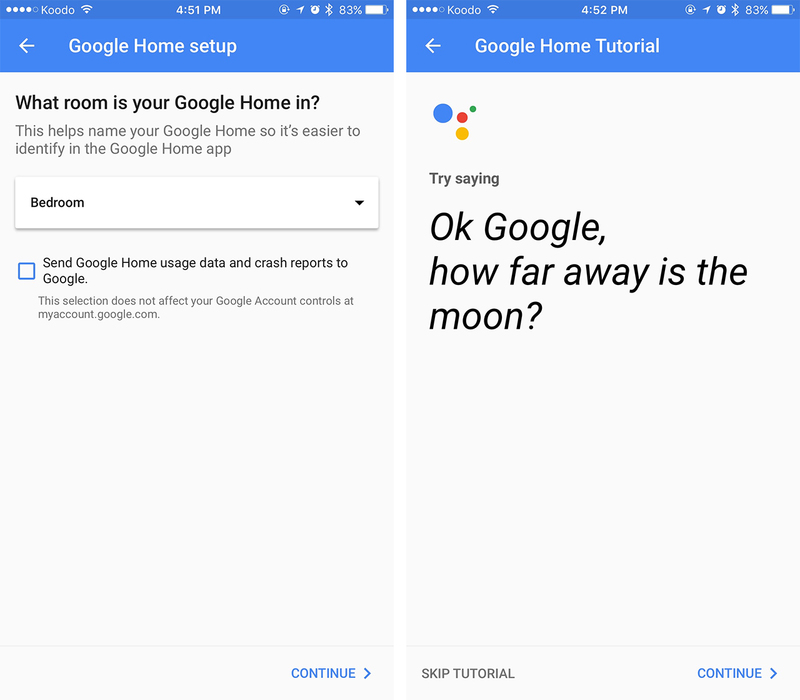 Other features include the ability to set Google Calendar appointments and asking questions via Google Assistant, perhaps Home’s most impressive feature. It’s difficult to stump Google Assistant, though if I tried, I was definitely able to. Questions need to be specific and there are certain subjects Assistant disappointingly doesn’t seem to be capable of sourcing. Assistant, unfortunately, isn’t always capable of following through with follow-up questions either. For example, if you say ‘Okay, Google, what is the latest Star Wars movie,’ then ask, ‘Ok, Google, tell me more,” Home often won’t contextually know what subject you’re referring to, despite the fact that you asked the initial question less than 30 seconds ago. However, given that the Echo is only able to search for answers via Wikipedia, Amazon’s device is limited in its capacity to search; this is not the case with Home. Simply just asking Home to play a podcast works relatively well, though there were a few instances where the device couldn’t locate the show I asked it to find. Google says it’s also working with mainstream news organizations including the CBC, Global News, Sportsnet and The Weather Network to provide Canadian-centric news to the platform, a feature that’s great if you’re looking to recap the top stories of the day. I was also impressed with Home’s Chromecast integration, allowing me to give the device commands like, “Okay Google, stream House of Cards from Netflix,” making the show appear on my Chromecast-connected television, though my television needed to be turned on and set to the correct input first. Sometimes Home would experience difficulty locating specific episodes, but jumping between episodes works surprisingly well. While not exactly a practical way of watching TV, it’s hard not to smile when something plays on your TV with a simple, one-sentence voice command. Some of the features I expected Home to launch with including being able to read off my top five to 10 emails, for example, are strangely absent from Home’s functionality. You’d think that services like Keep, Voice or even Docs would work with Home, but that’s unfortunately not the case in the device’s current state. Looking to the future, Home is getting hands-free calling and Bluetooth speaker connectivity at some point in 2017 — a big win for people with high-end Bluetooth speakers who want to use them with Google’s Home. Visual responses that allow the speaker to send graphical information to either your phone, tablet or TV, which seems like an attempt to match the functionality of Amazon’s recently announced display-featuring Echo Show, are also coming to Home as well. Proactive assistance is likely Home’s best upcoming feature, allowing the device to warn users about upcoming traffic delays on their way to work, as well as other important information like weather warnings. It’s important to point out that it’s unclear when these updates will go live and if Canada will even be a launch region for the new functionality. Overall, I'm pleased with the Home and happy that Google has opted to finally bring the device to Canada. 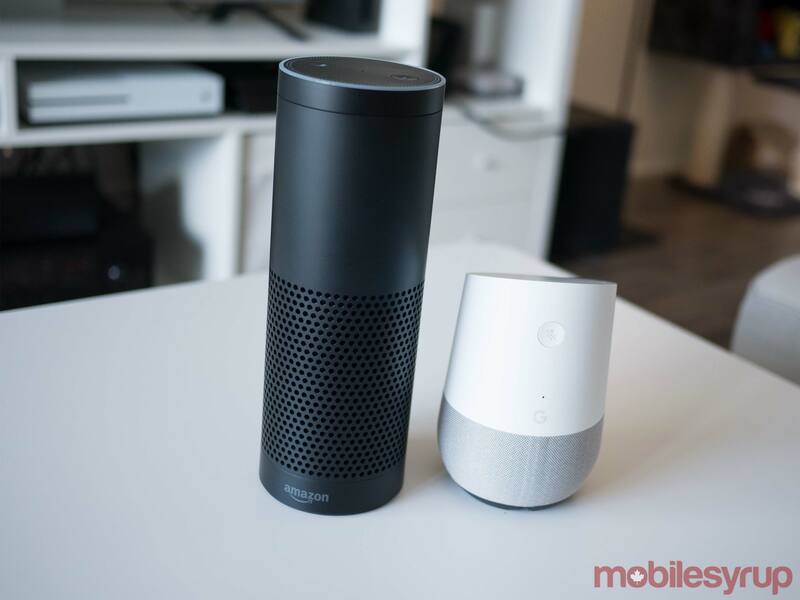 Home could easily replace my Echo and probably will given how it matches the functionality Amazon's IoT device is capable of, but also features Google Assistant. 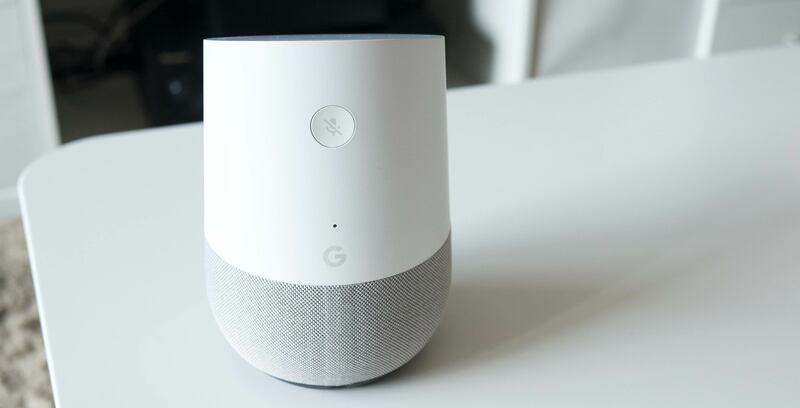 Google home does have downsides, including less accurate voice recognition and less-than-stellar speaker quality, which could lead some to opt for the Echo if they're able to snag one. It's possible to get your hands on an Echo in Canada with a little creativity, and apart from ordering products directly from Amazon with voice commands, it actually works quite well north of the U.S. border. Still, given Home's wide availability in the Canadian market, most people will opt to purchase Google's device instead. Google Home is available for $179 CAD at Best Buy and directly through the online Google Store. 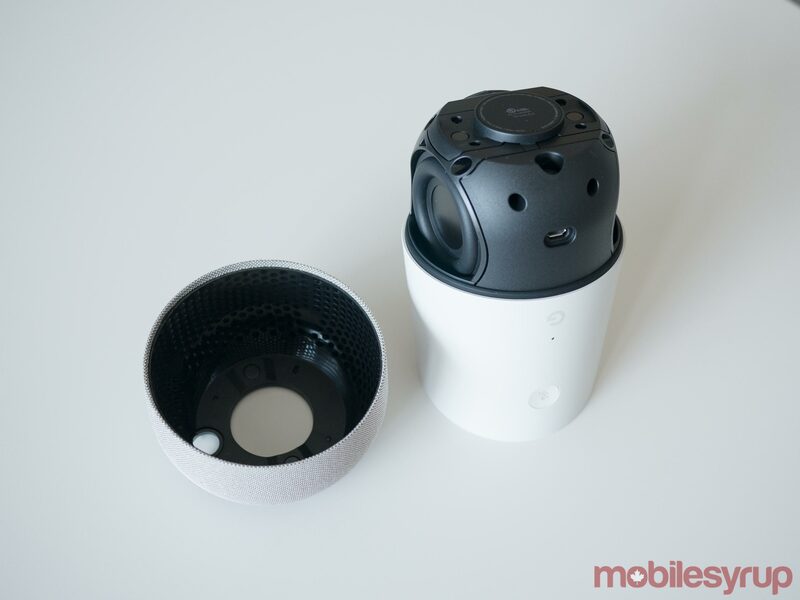 The Canadian version of the smart home assistant is also capable of understanding French, marking the first time the device has featured a language other than English.